Various forecasting methods based on fuzzy time series (FTS) have been proposed. However, most of the models used discrete fuzzy sets as a basis for calculating the forecasted values and thus cannot provide the forecasted range under different degree of confidence. A few FTS models used trapezoidal fuzzy numbers (TrFNs) for calculating the forecasted values and produces the forecasted values in term of TrFNs. However, in order to calculate the forecasting accuracy, the forecasted values in terms of TrFNs must be defuzzified. During the defuzzification process, some information has lost from the data which contributed to the inability to grasp the sense of uncertainty that has been kept throughout the forecasting process. In this paper, we propose a new FTS forecasting method based on FTS, TrFNs and center of gravity (COG) similarity measure approach. The COG approach is used to get the forecasting accuracy and to preserve the information that has been kept from being lost. The advantage of the proposed method is that the defuzzification process does not involve. 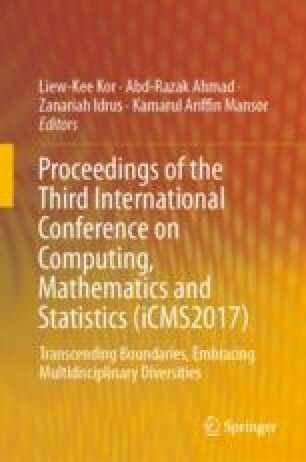 This research is supported by Ministry of Education Malaysia (MOE) and Universiti Teknologi MARA Malaysia (UiTM) under the Research Grant No. 600-RMI/RAGS 5/3 (149/2014).